The United States is a melting pot of different racial and ethnic groups, but it has not been clear how the genetic ancestry of these populations varies across different geographic regions. In a landmark study published by Cell Press December 18th in the American Journal of Human Genetics, researchers analyzed the genomes of more than 160,000 African Americans, Latinos, and European Americans, providing novel insights into the subtle differences in genetic ancestry across the United States. "Our study not only reveals the historical underpinnings of regional differences in genetic ancestry but also sheds light on the complex relationships between genetic ancestry and self-identified race and ethnicity," says lead study author Katarzyna Bryc of 23andMe and Harvard Medical School. Over the past 500 years, North America has been the site of ongoing mixing of Native Americans, European settlers, and Africans. Although much of the world has been genetically characterized, the United States has received less attention from population geneticists because of its complex ancestry patterns. Moreover, the relationship between genetic ancestry and self-described racial and ethnic identities in each region of the United States has not been deeply characterized. To address this gap in knowledge, Bryc and her collaborators analyzed DNA sequence variations called single-nucleotide polymorphisms in the genomes of 5,269 self-described African Americans, 8,663 Latinos, and 148,789 European Americans. These individuals actively participate in 23andMe research by submitting saliva samples, consenting for data to be used for research, and completing surveys. 23andMe is a personal genomics company that provides direct-to-consumer genetic testing and services that include the analysis of DNA samples to generate ancestry-related genetic reports. The researchers found that regional ancestry differences reflect historical events such as waves of immigration. For example, Scandinavian ancestry is found in trace proportions in most states but comprises about 10% of ancestry in European Americans living in Minnesota and the Dakotas. They also found that individuals identify roughly with the majority of their genetic ancestry, contrary to expectations under a social "one-drop rule." 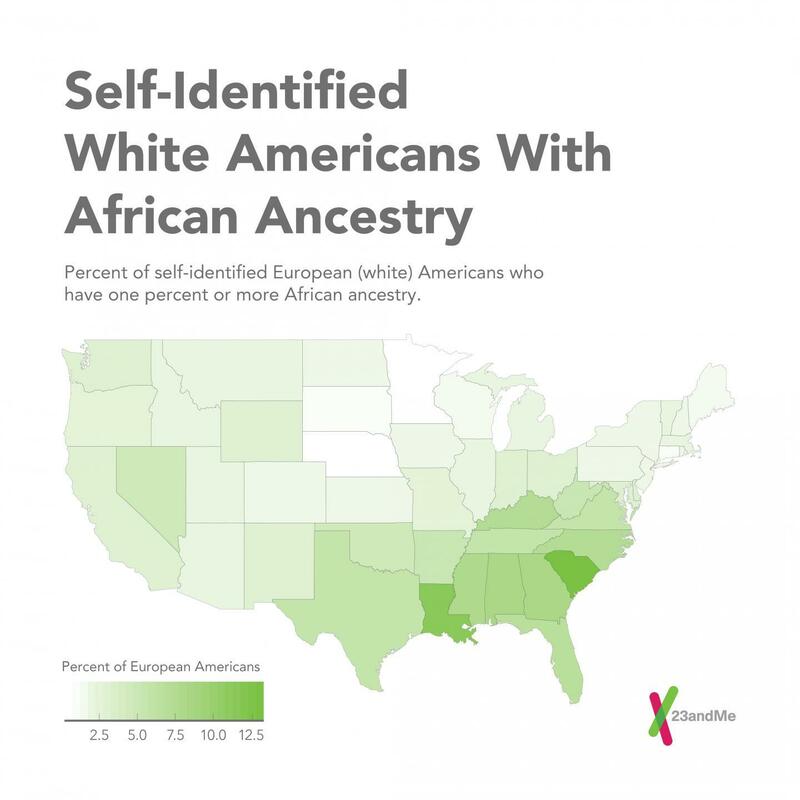 Indeed, more than six million Americans who self-identify as European might carry African ancestry, and as many as five million self-described European Americans might have at least 1% Native American ancestry. "These findings suggest that many individuals with partial African and Native American ancestry have 'passed' into the white community, thereby undermining the use of cultural labels that separate individuals into discrete, non-overlapping groups," Bryc says. "Taken together, our results suggest that genetic ancestry can be leveraged to augment historical records and inform cultural processes shaping modern populations." This infographic illustrates the mean proportion of African ancestry for African Americans across the United States. 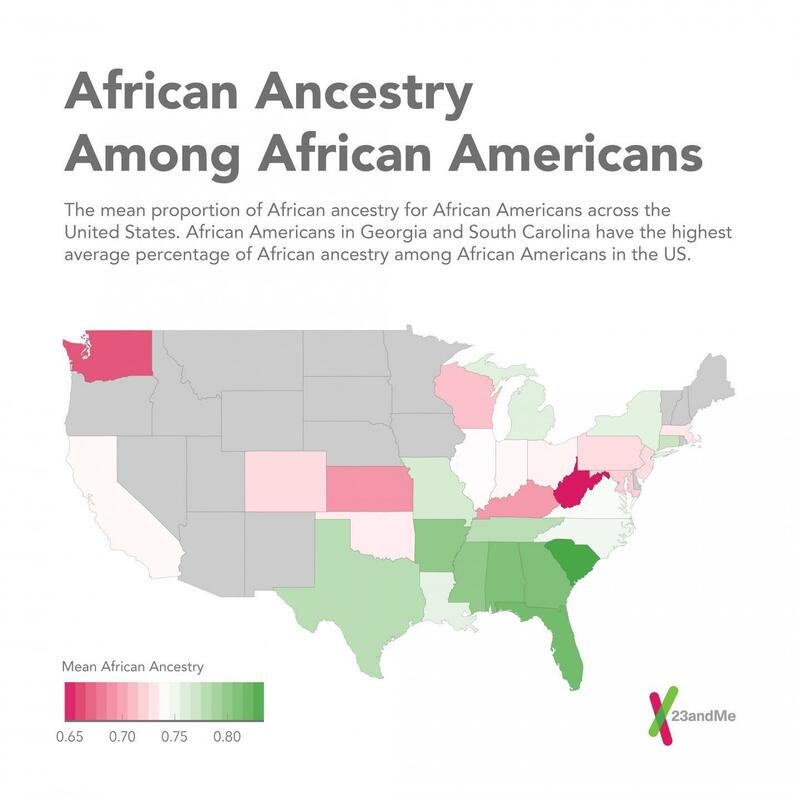 African Americans in Georgia and South Carolina have the highest average percentage of African ancestry among African Americans in the US.